Design your own Smart car | What Car? 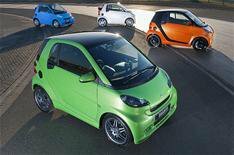 If driving a Smart car doesnt attract enough attention, soon owners will be able to tailor the cars design from an extensive menu of colours and interior styling touches. From the body panel colours to the stitching on the floormats, cars can be customised using the service from performance and styling specialists Brabus. There are 18 exterior colours to choose from, each with a supercar or heritage theme: for example, Campbell Blue celebrates the Bluebird land speed record cars. Inside, the colour will be applied to the door handles, dials and light and wiper levers. There are also six roof colours and nine leather/Alcantara upholstery options to help ensure no two cars are the same. For indecisive customers, there are three pre-selected packages to choose from; one each for Pulse, Passion and Brabus models. The service will be available from December, prices are yet to be confirmed.